The easiest way to reach Morioka is to take the train. From Narita Airport/Haneda Airport, you’ll take a train to Tokyo Station, from which you will take a shinkansen train (bullet train) straight to Morioka Station. *This guide assumes your starting point is in Tokyo. The Shinkansen leaves2-3 times an hour, and the last train from Tokyo to Morioka leaves at 8:20 pm. * On the 1F of Narita Airport, you'll also find cell phone rentals, money exchange, and shipping services for luggage. 2)	(If you purchased a JR Pass) Find the JR EAST Travel Service Center, and complete the paperwork for your JR Pass. 3)	Find the JR Narita Airport Station nearby, and look for the ticket office. It’s easiest to purchase your tickets here directly to Morioka. Just wait in line and tell the station officer “Morioka Station” and they will take care of getting your tickets/timing your transfer at Tokyo Station. If you have the JR Pass, show them the pass and your passport (you won’t have to pay anything additional for tickets, but they need to reserve a seat for you). Your ticket will be printed out in English with Japanese. You may have one ticket for the Narita Express, and one ticket for the Tohoku Shinkansen, and perhaps one or two more ticket stubs. On these tickets will be information about your train number, train times, seat and car numbers. If in doubt, ask any station officer. 4)	Show your tickets to the station officer manning the ticket gates (nearby the ticket office). Narita Express trains leave for Tokyo Station around once per hour. *Caution: There are two other train lines leaving from Narita Airport. One is the Keisei Skyliner, which is NOT JR, so you cannot use a JR Pass. The other is the JR Sobu line, a commuter style train that leaves from the same tracks as the Narita Express. Please make sure that the train you are getting on is the Narita Express. The Narita Express is a black, white, and red train that says NEX on the side. The Narita Express platform within Tokyo Station is deep underground, so you will need to take about three escalators up to ground level. DO NOT EXIT TOKYO STATION. Look for signs above that say TOHOKU SHINKANSEN. They will have a green Shinkansen mark on them. You’re headed for these TOHOKU SHINKANSEN lines; in particular, platform 20-23. *There is also a Tokaido Shinkansen, which is next to the Tohoku Shinkansen. Don’t mistake them! (Thankfully, you can’t go through the wrong ticket gates, but you might get a little lost) The Tokaido Shinkansen has blue signs, while the Tohoku Shinkansen has green signs. Keep looking for green! 6)	Once you reach the gates for the Tohoku Shinkansen, you will once again show your tickets to the station officer situated by the gates. 7)	Last, once inside, look for the train schedule board above. (Information will be shown in Japanese, and then in English). Use this to find your train’s platform (information which can be found on your ticket), or you can just ask a nearby station officer. 8)	About the Tohoku Shinkansen: The Tohoku Shinkansen leaves about 2-3 times an hour, with the last train from Tokyo to Morioka leaving at 8:20pm. There are a couple of different types of Tohoku Shinkansen that go to Morioka: the “Hayabusa/Super Komachi” and “Hayate/Komachi” are the express trains, and make stops in Omiya, Sendai, and then Morioka (and a few more stops in between). They will get you to Morioka in a little over 2 hours. The Hayabusa and Hayate are both reserved seats only. The other train, the “Yamabiko”, stops at every single station and will get you to Morioka in over three hours. If you are not using the JR Pass and would like to save about 500 yen, you can get a non-reserved seat on the Yamabiko. However, some Yamabiko trains only go up to Sendai. We recommend you get your tickets at the ticket office so the station master can select the best itinerary for you. *A note about the “Hayabusa/Super Komachi” and “Hayate/Komachi” trains. These trains are actually two trains interlocked together – an engineering marvel! These trains travel together from Tokyo to Morioka Station, where they separate into two trains again. One train will go north to Aomori, and one will go west to Akita. However, it doesn’t matter which train you board to Morioka: both the Hayabusa and Super Komachi (or the Hayate and Komachi) will take you to Morioka! 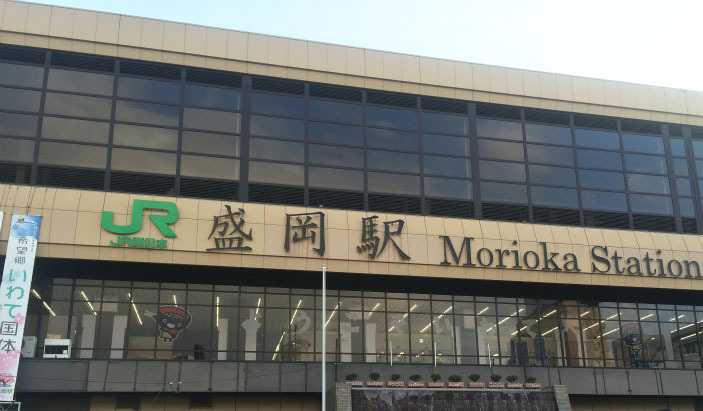 9)	You’ve arrived in Morioka Station! Taxis are available to take you to your hotel (look for the signs above that say Taxi). If you take a taxi, just let them know your hotel name and they will take you directly there. 1)	Find the Tokyo Monorail Station (run by JR) at Haneda Airport. At the nearby JR EAST Travel Service Center, you can complete the paperwork for your JR Pass (if you purchased one). 2)	Look for the Tokyo Monorail ticket office. It’s easiest to purchase your tickets here directly to Morioka. Just wait in line and tell the station officer “Morioka Station” and they will take care of getting your tickets/timing your transfer at Tokyo Station. If you have the JR Pass, show them the pass and your passport. 5)	Refer to directions 5-9 above. You’ll be using the shinkansen train (bullet train) to get to Morioka and Iwate Prefecture. These are all run by Japan Rail (JR), so consider purchasing a JR Pass or JR EAST Pass which a flat fee pass that allows you to ride any train without limits over a set period of time. However, the JR Pass must be purchased outside of Japan. Please search online or ask your travel company for details. Iwate does have a small airport in Iwate-Hanamaki Airport (an hour’s drive south of Morioka). Unfortunately, Iwate-Hanamaki only serves domestic flights and an occasional charter from Taiwan. There are no flights from Narita or Haneda to Iwate-Hanamaki. The easiest way to Morioka is to enter Japan through Narita or Haneda Airports, and then take the shinkansen train to Morioka Station. 1)	If you plan to travel directly from the airport to Morioka, aim to arrive in Japan by about 4 pm, or else you may miss the last shinkansen train. 2)	WiFi access is limited in Japan, and foreign cell phones may or may not work on Japanese mobile networks. We recommend you rent a cell phone or pocket wifi at the airport. 3)	Please exchange money before you leave the airport. It is difficult to do once you reach Iwate. 4)	Those with dietary restrictions: It’s very difficult to find vegetarian or halal food while in Japan, especially in transit. Please plan accordingly. 5)	Foreign visitors must always have their passport on their person while traveling in Japan. 6)	If you plan to tour Tokyo before going to Morioka: You can get your shinkansen ticket to Morioka from any ticket office at any JR Station in Japan. You can look up train times/itineraries in English at www.hyperdia.com. 7)	If you are carrying heavy bags: consider having them shipped from the airport to your final destination. There is not much room on the Tohoku Shinkansen for large luggage. 8)	There are many other ways to get to Morioka from Tokyo (overnight buses, automobile), or from other places in Japan, but regretfully we can’t explain them all. Searching online or asking with your travel agent will net you the best results. 2)	Do I have to buy my shinkansen ticket beforehand? Or can I buy it at the station? You will be fine to reserve seats on the day of travel right before you board your train. If you can read Japanese, then you can reserve seats online through www.eki-net.com. 3)	How many trains are there between Tokyo and Morioka? The Tohoku Shinkansen leaves about 2-3 times an hour, with the last train from Tokyo to Morioka leaving at 8:20pm. There are a couple of different types of Tohoku Shinkansen: the Hayabusa/Super Komachi and Hayate/Komachi are the express trains, and make stops in Omiya, Sendai, and then Morioka (and a few more stops in between). They will get you to Morioka in a little over 2 hours. The Hayabusa and Hayate are both reserved seats only. The other train, the Yamabiko, stops at every single station and will get you to Morioka in over three hours. If you are not using the JR Pass and would like to save about 500 yen, you can get a non-reserved seat on the Yamabiko. However, some Yamabiko trains only go up to Sendai. We recommend you get your tickets at the ticket office so the station master can select the best itinerary for you. *A note about the Hayabusa/Super Komachi and Hayate/Komachi trains. These trains are actually two trains interlocked together – an engineering marvel! These trains travel together from Tokyo to Morioka Station, where they separate into two trains again. One train will go north to Aomori, and one will go west to Akita. However, it doesn’t matter which train you board to Morioka: both the Hayabusa and Super Komachi (or the Hayate and Komachi) will take you to Morioka! 5)	Are there any flights from Narita to Iwate-Hanamaki Airport? No. Iwate-Hanamaki Airport only has flights to Sapporo, Nagoya, Osaka (Itami), and Fukuoka. There are no flights to Narita, Haneda, or Sendai Airports. 6)	What about flights from Narita to Sendai, and getting to Iwate from Sendai? There are two flights a day from Narita to Sendai, so you could theoretically do this. Once you arrive at Sendai Airport, you can take a train from Sendai Airport to Sendai Station (30 min), and then take the Shinkansen north to Morioka Station (1 hour). The issue is the transfer at Narita Airport: you must exit the international terminal entirely, find the domestic terminal, check in with your bags again, etc. It’s easier to just take the train from Narita to Tokyo, then to Morioka. *There are no flights between Sendai and Iwate-Hanamaki Airport. Copyright © LCWS2016. All rights reserved.